Not to be confused with the Fukushima Daini Nuclear Power Plant. The Fukushima Daiichi Nuclear Power Plant (福島第一原子力発電所, Fukushima Daiichi Genshiryoku Hatsudensho) is a disabled nuclear power plant located on a 3.5-square-kilometre (860-acre) site in the towns of Ōkuma and Futaba in the Fukushima Prefecture, Japan. The plant suffered major damage from the magnitude 9.0 earthquake and tsunami that hit Japan on March 11, 2011. The chain of events caused radiation leaks and permanently damaged several reactors, making them impossible to restart. By political decision, the remaining reactors were not restarted. First commissioned in 1971, the plant consists of six boiling water reactors. These light water reactors drove electrical generators with a combined power of 4.7 GWe, making Fukushima Daiichi one of the 15 largest nuclear power stations in the world. Fukushima was the first nuclear plant to be designed, constructed and run in conjunction with General Electric and Tokyo Electric Power Company (TEPCO). The March 2011 disaster disabled the reactor cooling systems, leading to releases of radioactivity and triggering a 30 km evacuation zone surrounding the plant; the releases continue to this day. On April 20, 2011, the Japanese authorities declared the 20 km evacuation zone a no-go area which may only be entered under government supervision. In April 2012, Units 1-4 were decommissioned. Units 2-4 were decommissioned on April 19, while Unit 1 was the last of these four units to be decommissioned on April 20 at midnight. In December 2013 TEPCO decided none of the undamaged units will reopen. The sister nuclear plant Fukushima Daini ("number two"), 12 km (7.5 mi) to the south, is also run by TEPCO. It also suffered serious damages during the tsunami, especially at the seawater intakes of all four units, but could be shut down and brought to a safe state through extraordinary actions by the plant crew. Cross-section sketch of a typical BWR Mark I containment, as used in Units 1 to 5. 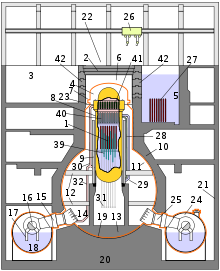 The reactor core (1) consists of fuel rods and control rods (39) which are moved in and out by the device (31). Around the pressure vessel (8), there is an outer containment (19) which is closed by a concrete plug (2). When fuel rods are moved in or out, the crane (26) will move this plug to the pool for facilities (3). Steam from the dry well (11) can move to the wet well (24) through jet nozzles (14) to condense there (18). In the spent fuel pool (5), the used fuel rods (27) are stored. The reactors for Units 1, 2, and 6 were supplied by General Electric, those for Units 3 and 5 by Toshiba, and Unit 4 by Hitachi. All six reactors were designed by General Electric. Architectural design for General Electric's units was done by Ebasco. All construction was done by Kajima. Since September 2010, Unit 3 has been fueled by a small fraction (6%) of plutonium containing mixed-oxide (MOX) fuel, rather than the low enriched uranium (LEU) used in the other reactors. Units 1–5 were built with Mark I type (light bulb torus) containment structures. The Mark I containment structure was slightly increased in volume by Japanese engineers. Unit 6 has a Mark II type (over/under) containment structure. Unit 1 is a 460 MW boiling water reactor (BWR-3) constructed in July 1967. It commenced commercial electrical production on March 26, 1971, and was initially scheduled for shutdown in early 2011. In February 2011, Japanese regulators granted an extension of ten years for the continued operation of the reactor. It was damaged during the 2011 Tōhoku earthquake and tsunami. Unit 1 was designed for a peak ground acceleration of 0.18 g (1.74 m/s2) and a response spectrum based on the 1952 Kern County earthquake, but rated for 0.498 g. The design basis for Units 3 and 6 were 0.45 g (4.41 m/s2) and 0.46 g (4.48 m/s2) respectively. All units were inspected after the 1978 Miyagi earthquake when the ground acceleration was 0.125 g (1.22 m/s2) for 30 seconds, but no damage to the critical parts of the reactor was discovered. The design basis for tsunamis was 5.7 meters. The reactor's emergency diesel generators and DC batteries, crucial components in helping keep the reactors cool in the event of a power loss, were located in the basements of the reactor turbine buildings. The reactor design plans provided by General Electric specified placing the generators and batteries in that location, but mid-level engineers working on the construction of the plant were concerned that this made the backup power systems vulnerable to flooding. TEPCO elected to strictly follow General Electric's design in the construction of the reactors. The plant is on a bluff which was originally 35 meters above sea level. During construction, however, TEPCO lowered the height of the bluff by 25 meters. One reason for lowering the bluff was to allow the base of the reactors to be constructed on solid bedrock in order to mitigate the threat posed by earthquakes. Another reason was the lowered height would keep the running costs of the seawater pumps low. TEPCO's analysis of the tsunami risk when planning the site's construction determined that the lower elevation was safe because the sea wall would provide adequate protection for the maximum tsunami assumed by the design basis. However, the lower site elevation did increase the vulnerability for a tsunami larger than anticipated in design. 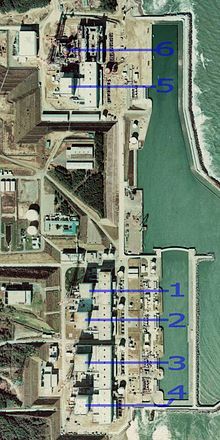 The Fukushima Daiichi site is divided into two reactor groups, the leftmost group - when viewing from the ocean - contains units 4, 3, 2 and 1 going from left to right. The rightmost group - when viewing from the ocean - contains the newer units 5 and 6, respectively, the positions from left to right. A set of seawalls protrude into the ocean, with the water intake in the middle and water discharge outlets on either side. Units 7 and 8 were planned to start construction in April 2012 and 2013 and to come into operation in October 2016 and 2017 respectively. The project was formally canceled by TEPCO in April 2011 after local authorities questioned the fact that they were still included in the supply plan for 2011, released in March 2011, after the accidents. The company stated that the plan had been drafted before the earthquake. The Fukushima Daiichi plant is connected to the power grid by four lines, the 500 kV Futaba Line (双葉線), the two 275 kV Ōkuma Lines (大熊線) and the 66 kV Yonomori Line (夜の森線) to the Shin-Fukushima (New Fukushima) substation. The Shin-Fukushima substation also connects to the Fukushima Daini plant by the Tomioka Line (富岡線). Its major connection to the north is the Iwaki Line (いわき幹線), which is owned by Tohoku Electric Power. It has two connections to the south-west that connect it to the Shin-Iwaki substation (新いわき). The plant reactors came online one at a time beginning in 1970 and the last in 1979. From the end of 2002 through 2005, the reactors were among those shut down for a time for safety checks due to the TEPCO data falsification scandal. On February 28, 2011, TEPCO submitted a report to the Japanese Nuclear and Industrial Safety Agency admitting that the company had previously submitted fake inspection and repair reports. The report revealed that TEPCO failed to inspect more than 30 technical components of the six reactors, including power boards for the reactor's temperature control valves, as well as components of cooling systems such as water pump motors and emergency power diesel generators. In 2008, the IAEA warned Japan that the Fukushima plant was built using outdated safety guidelines, and could be a "serious problem" during a large earthquake. The warning led to the building of an emergency response center in 2010, used during the response to the 2011 nuclear accident. On April 5, 2011, TEPCO vice president Takashi Fujimoto announced that the company was canceling plans to build Reactors No. 7 and 8. On May 20 TEPCO's board of directors' officially voted to decommission Units 1 through 4 of the Fukushima Daiichi nuclear power plant and to cancel plans to build units 7 and 8. It refused however to make a decision regarding units 5 and 6 of the station or units 1 to 4 of the Fukushima Daini nuclear power station until a detailed investigation is made. In December 2013 TEPCO decided to decommission the undamaged units 5 and 6; they may be used to test remote clean-up methods before use on the damaged reactors. In 1990, the U.S. Nuclear Regulatory Commission (NRC) ranked the failure of the emergency electricity generators and subsequent failure of the cooling systems of plants in seismically very active regions one of the most likely risks. The Japanese Nuclear and Industrial Safety Agency (NISA) cited this report in 2004. According to Jun Tateno, a former NISA scientist, TEPCO did not react to these warnings and did not respond with any measures. Filmmaker Adam Curtis mentioned the risks of the type of boiling water reactors cooling systems such as those in Fukushima I, and claimed the risks were known since 1971 in a series of documentaries in the BBC in 1992 and advised that PWR type reactors should have been used. TEPCO, that operated the station, had been warned their seawall was insufficient to withstand a powerful tsunami, but the seawall height was not increased in response. While other stations run by the Tohoku Electric Power company had much more robust seawalls (such as the Onagawa Nuclear Power Plant) down the coast closer to the epicenter of the earthquake, the Fukushima Plant did not. Fuel rods fell in reactor No. 3, causing a nuclear reaction. It took about seven and a half hours to place the rods back into proper positions. A manual shutdown was initiated during the middle of a start-up operation. The cause was a high pressure alarm that was caused by the shutting of a turbine bypass valve. The reactor was at 12% of full power when the alarm occurred at 4:03 am (local time) due to a pressure increase to 1,030 psi (7,100 kPa), exceeding the regulatory limit of 1,002 psi (6,910 kPa). The reactor was reduced to 0% power, which exceeded the 5% threshold that requires event reporting, and pressure dropped back under the regulatory limit at 4:25 am. Later, at 8:49 am the control blades were completely inserted, constituting a manual reactor shutdown. An inspection then confirmed that one of the 8 bypass valves had closed and that the valve had a bad driving fluid connection. The reactor had been starting up following its 25th regular inspection, which had begun on October 18, 2008. Unit 3 had problems with over-insertion of control blades during outage. Repair work was being done on equipment that regulates the driving pressure for the control blades, and when a valve was opened at 2:23 pm a control blade drift alarm went off. On later inspection, it was found that several of the rods had been unintentionally inserted. Unit 5 had an automatic SCRAM while an operator was conducting an adjustment to the control blade insertion pattern. The SCRAM was caused by a reactor low water level alarm. The turbine tripped along with the reactor and there was no radiation injury to workers. Three of the reactors at Fukushima Daiichi overheated, causing meltdowns that eventually led to explosions, which released large amounts of radioactive material into the air. On March 11, 2011, an earthquake categorized as 9.0 MW on the moment magnitude scale occurred at 14:46 Japan Standard Time (JST) off the northeast coast of Japan, one of the most powerful earthquakes in history. Units 4, 5 and 6 had been "shut down" prior to the earthquake for planned maintenance. The remaining reactors were shut down/SCRAMed automatically after the earthquake, and the remaining decay heat of the fuel was being cooled with power from emergency generators. The subsequent destructive tsunami with waves of up to 14 meters that over-topped the station, which had seawalls, disabled emergency generators required to cool the reactors and Spent fuel pools in Units 1-5. Over the following three weeks there was evidence of partial nuclear meltdowns in units 1, 2 and 3: visible explosions, suspected to be caused by hydrogen gas, in units 1 and 3; a suspected explosion in unit 2, that may have damaged the primary containment vessel; and a possible uncovering of the Spent fuel pools in Units 1, 3 and 4. Units 5 & 6 were reported on March 19, by the station-wide alert log updates of the IAEA, to have gradually rising spent fuel pool temperatures as they had likewise lost offsite power, but onsite power provided by Unit 6's two diesel generators that had not been flooded, were configured to do double-duty and cool both Unit 5 and 6's spent fuel pools "and cores". As a precautionary measure, vents in the roofs of these two units were also made to prevent the possibility of hydrogen gas pressurization and then ignition. Radiation releases from Units 1-4 caused large evacuations, concern about food and water supplies, and treatment of nuclear workers. Radiation releases also contaminated the 2011 harvest. The events at units 1, 2 and 3 have been rated at Level 5 each on the International Nuclear Event Scale, and those at unit 4 as Level 3 (Serious Incident) events, with the overall plant rating at Level 7 (major release of radioactive material with widespread health and environmental effects requiring implementation of planned and extended countermeasures). 2 bodies were discovered in the basement turbine room, most likely because the workers ran there during the tsunami. Radioactive water leaked from the storage units, minimally contaminating the soil and water nearby. The leak was controlled and stored in a contained area. The stored water continues to require maintenance, until its ultimate purification. TEPCO officials reported that radioactive caesium was 90 times higher than it was 3 days prior (July 6), and that it may spread into the Pacific Ocean. TEPCO reported that the caesium-134 levels in the well water were measured at 9 kilobecquerel per liter, 150 times the legal level, while Caesium-137 was measured at 18 kilobecquerel per liter, 200 times the permitted level. Japanese officials said highly radioactive water was leaking from Fukushima Daiichi into the Pacific Ocean at a rate of 300 tons (about 272 metric tons) per day. Japanese Prime Minister Shinzo Abe ordered government officials to step in. Melted reactors were being cooled down with 300 tonnes of water each day. In November 2016, a 6.9 magnitude earthquake struck off the northeast coast of Japan, causing a 1m tsunami to hit the Fukishima plant. A cooling system for spent nuclear fuel was temporarily stopped. The reactors will take 30–40 years to be decommissioned. On August 1, 2013, the Japanese Industry Minister Toshimitsu Motegi approved the creation of a structure to develop the technologies and processes necessary to dismantle the four reactors damaged in the Fukushima accident. Wikimedia Commons has media related to Fukushima I Nuclear Power Plant. ^ "Tokyo Electric Power Co. Fukushima Daiichi Nuclear Power Station". jnes.go.jp. Archived from the original on March 14, 2011. Retrieved March 17, 2011. ^ The Fukushima Daiichi Accident (PDF). Wienna: IAEA - International Atomic Energy Agency. August 31, 2015. pp. 131–132. ISBN 978-92-0-107015-9. Retrieved October 12, 2018. ^ Asami, Eiichi (Kyodo News), "American's Fukushima legacy lives on", Japan Times, September 14, 2011, p. 3. ^ a b c "Nuclear Reactor Maps: Fukushima-Daiichi". Council for Security Cooperation in the Asia Pacific. Archived from the original on January 15, 2013. Retrieved March 14, 2011. ^ "Plutonium In Fuel Rods: Cause For Concern?". National Public Radio. March 16, 2011. Retrieved March 20, 2011. ^ "Fukushima to Restart Using MOX Fuel for First Time". Nuclear Street. September 17, 2010. Retrieved March 12, 2011. ^ "Third Japanese reactor to load MOX". World Nuclear News. August 10, 2010. Retrieved March 12, 2011. ^ a b c d Brady, A. Gerald (1980). Ellingwood, Bruce (ed.). An Investigation of the Miyagi-ken-oki, Japan, earthquake of June 12, 1978. NBS special publication. 592. United States Department of Commerce, National Bureau of Standards. p. 123. ^ a b "Fact Sheet on Fukushima Nuclear Power Plant" (PDF). Nuclear Information and Resource Service. March 13, 2011. Retrieved March 13, 2011. ^ Lahey, R.T. and Moody, F.J., "The Thermal-Hydraulics of a Boiling Water Reactor", second edition, 1993. ^ Sandia National Laboratories (July 2006). "Containment Integrity Research at Sandia National Laboratories – An Overview" (PDF). U.S. Nuclear Regulatory Commission. NUREG/CR-6906, SAND2006-2274P. Archived from the original (PDF) on July 21, 2011. Retrieved March 13, 2011. ^ "Fukushima Daiichi Information Screen". Icjt.org. Archived from the original on August 1, 2012. Retrieved March 15, 2011. ^ Yamaguchi, Mari; Donn, Jeff (March 12, 2011). "Japan quake causes emergencies at 5 nuke reactors". Forbes. Retrieved March 12, 2011. ^ "Nuke database system: fukushima daiichi-1". ICJT Nuclear Training Centre. Retrieved March 12, 2011. ^ "Fukushima faced 14-metre tsunami". World Nuclear News. March 24, 2011. Retrieved March 24, 2011. ^ "Stabilisation at Fukushima Daiichi, update 2". World Nuclear News. March 20, 2011. Retrieved March 20, 2011. ^ Yoshida, Reiji, "GE plan followed with inflexibility", Japan Times, July 14, 2011, p. 1. ^ "Fukushima plant site originally was a hill safe from tsunami". The Japan Times. Retrieved September 29, 2011. ^ "Nuclear Power in Japan". World Nuclear Association. February 24, 2011. Retrieved March 12, 2011. ^ a b "Reactors in operation". IAEA. December 31, 2009. Retrieved March 12, 2011. ^ a b c d e f "Japan: Nuclear Power Reactors". Power Reactor Information System – PRIS. IAEA. Archived from the original on May 28, 2011. Retrieved March 14, 2011. ^ "Heavy fallout from Japan nuclear scandal". CNN. September 2, 2002. Archived from the original on March 15, 2011. Retrieved March 15, 2011. ^ Cooke, Stephanie (2009). In Mortal Hands: A Cautionary History of the Nuclear Age. Bloomsbury Publishing. p. 388. ISBN 978-1-59691-617-3. ^ "Operator of Fukushima nuke plant admitted to faking repair records". Herald Sun. Australia. March 20, 2011. Retrieved March 20, 2011. ^ "Japan tsunami: Fukushima Fifty, the first interview". Retrieved February 7, 2017. ^ Mainichi Shimbun, "TEPCO to drop plan to add two reactors at Fukushima nuclear plant", April 5, 2011. ^ Higgins, Andrew, Washington Post, "March 26: More reactors sought for plant? ", Japan Times, April 7, 2011, p. 2. ^ "TEPCO will decommission Fukushima Daiichi 5&6". Nuclear Engineering International. December 19, 2013. Retrieved December 21, 2013. ^ Adam Curtis (March 16, 2011). "A Is For Atom". British Broadcasting Corporation. Retrieved May 19, 2013. ^ Ralf Streck (March 22, 2011). "Notkühlprobleme von Fukushima-Reaktoren seit 1971 bekannt". Telepolis. Heise Zeitschriften Verlag. Archived from the original on April 1, 2011. Retrieved April 1, 2011. ^ NORIHIKO SHIROUZU and REBECCA SMITH (March 16, 2011). "Plant's Design, Safety Record Are Under Scrutiny". The Wall Street Journal. ^ Tepco official release (Japanese).Manual shutdown during reactor startup operations in Fukushima I-1. February 2, 2009. ^ Tepco official release (Japanese). Over-insertion of control rods in Fukushima I-3. ^ Tepco official release (Japanese). Fukushima I-5 Automatic SCRAM Information. ^ Black, Richard (March 15, 2011). "Reactor breach worsens prospects". BBC News. Retrieved March 17, 2011. ^ Biela Liwag. "Government Scientists on Japan Nuke Meltdown "No need to worry"". Noypi.ph. Retrieved March 14, 2011. ^ "Conditions of Fukushima Dai-ichi Nuclear Power Station Unit 2 as of 14:00 March 27, 2011" (PDF). Archived from the original (PDF) on May 23, 2011. Retrieved February 7, 2017. ^ a b "Japanese Earthquake Update (19 March 2011, 4:30 UTC) : IAEA Alert Log: Fukushima Daiichi Nuclear Accident". June 7, 2011. Archived from the original on June 7, 2011. Retrieved February 7, 2017. ^ "Radiation leak feared at nuke plant, people urged to stay indoors". Kyodo News Agency. March 15, 2011. Archived from the original on March 16, 2011. ^ "Exposures and progress at Fukushima Daiichi". World Nuclear News. March 24, 2011. ^ "Japan Earthquake Update". IAEA. March 19, 2011. ^ Black, Richard. "Radioactive cesium level soars 90-fold at Fukushima in just 3 days". ^ Saito, Mari and Antoni Slodkowski (August 8, 2013). "Japan says Fukushima leak worse than thought, government joins clean-up". Reuters. Retrieved August 8, 2013. ^ "Japan prepares to release thousands of tonnes of water containing radioactive tritium from the beleaguered Fukushima plant amid fears for impact on Pacific Ocean;from google (tritium in water taste) page 2 result 10". ^ "Fukushima Daiichi Decommissioning Project | TEPCO". www7.tepco.co.jp. Retrieved December 22, 2018. Archived photo. Units 1–4 can be seen from left to right. This page was last edited on 11 April 2019, at 13:54 (UTC).